This sim is device specific - you must enter your device model in the box, we are not responsible if you list the wrong device. Example an iPhone 5 sim card WILL NOT work in a 5S or 5C if you are unsure of your device model give us a call and we can help you order the correct sim. Brand New in the box, this device only works on the Sprint network. Treat yourself to the top of the line ZTE device with an extra-large 6” touchscreen display, 1.4GHz Octa-Core Processor, and the latest version of AndroidTM 7.1.1 Nougat OS. Capture stunning photos with the 13MP rear-facing camera and sharable-selfies with the 5MP front-facing lens. Browse, talk, text and play longer with a 3,990mAh battery. CPO device. 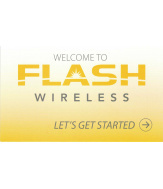 Flash Wireless approved.